Las Vegas - John Panek of Davenport Country Club and his team of Eric Langan, Tate Featherstone, Pat Wood, and Pete Stopulos clinched the 2018 Las Vegas Pro-Am today at the Dragon Ridge Country Club. The team tallied -10 quota points in round three for a tournament total of 18 quota points. Team No. 18, Tanner Megal, PGA, Jordan Caviness, Justin Sloan, Ryan Phelan, and John Fischer, finished in second place after a third round 12.75 quota points for a total of 3.25 quota points. Team No. 19 (Chad Callan, PGA, Mike Long, Anthony Long, TJ Lynch, and Tod Puetz) came in third with -1 quota points. The team recorded 7 quota points in the final round. Fourth place was secured by team No. 12 (Curt Schnell, PGA, Gary Steigh, Jim Hauer, Mike Lamb, and Ron Coe). Team No. 12 registered 11.5 quota points in round three for a tournament total of -3.5. Team No. 20 comprised of Chris Black, PGA, Adam Harrington, Bruce Neeley, Travis Hartman, and Chris Beatty rounded out the top five. The team finished with -4 quota points after tailing 16 quota points in the final round. Team Nos. 5, 17, 15, and 20 were the third round winners. 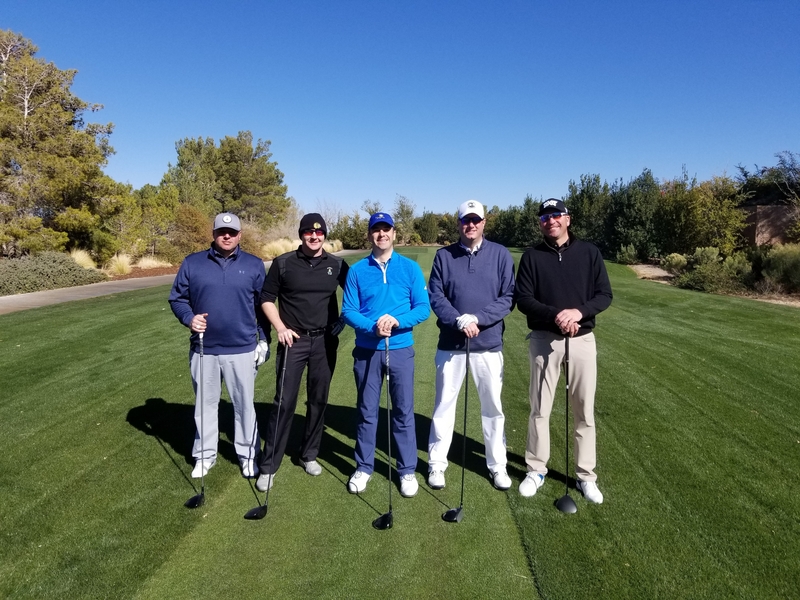 Team five, Monte Meyer, PGA, Drew Choplick, Jeff Krager, Gabe Wychoff, and Greg Vandersee, finished the third round with 20.75 quota points, giving them first place of the final round. The Iowa PGA would like to thank all the Professionals, Amateurs, golf courses and sponsors for helping put on another successful Las Vegas Pro-Am.